MOISTURE determination is an essential part of quality control procedures in many operations, to ensure product uniformity throughout production. Cole-Parmer says that its new Symmetry MB moisture determination balances offer an efficient new option for incoming inspection and receiving, quality control, and production. 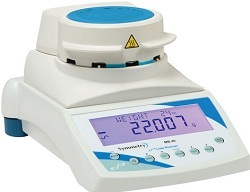 These balances feature an automatic test setting to run multiple tests quickly. An internal memory bank stores a range of test procedures that can be recalled at the touch of a button. The balance delivers results in grams, percent moisture, percent solids, percent moisture vs dry weight, and percent solid vs dry weight. The large display simultaneously shows temperature, time, and moisture, and displays and prints in English, German, French, or Spanish. A single 400W halogen heater controls temperatures from 50C to 160C, with overload protection and no requirement for any additional software. Balances feature both USB and directional RS-232 interfaces, and are available in 115 or 220V models.